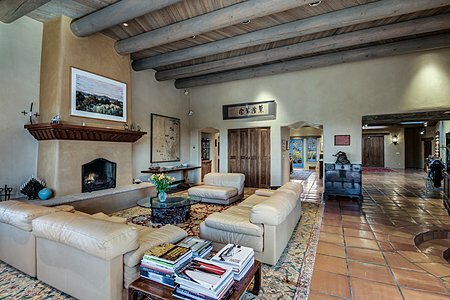 Set in La Tierra, this exceptional 5 bedroom, 8 bath home with 2-room studio on 16+ acres combines unparalleled elegance with comfort and style. Perfect for entertaining, the open living space offers an impressive yet inviting area in which to gather. 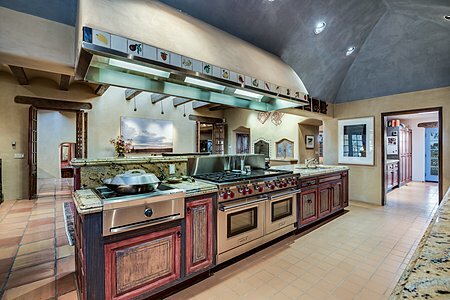 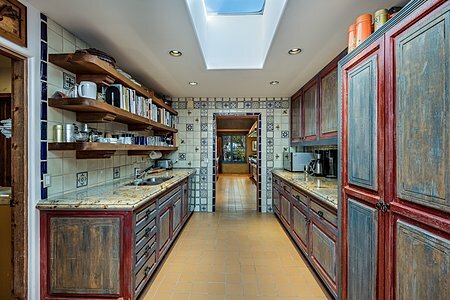 The well-appointed gourmet kitchen with adjacent dining area boasts a fireplace of its own, a 60 inch Wolf range, ample counterspace, plus a caterer's pantry. 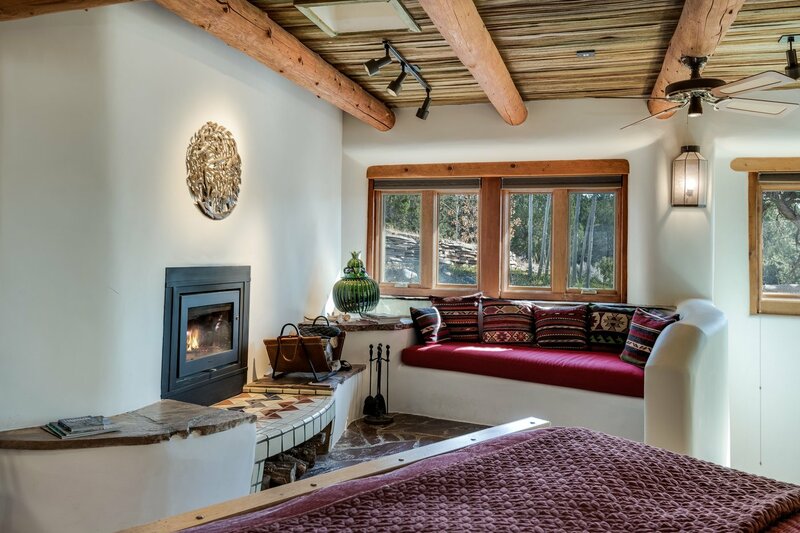 The master suite offers a spacious retreat including built in shelves, seating area and fireplace. 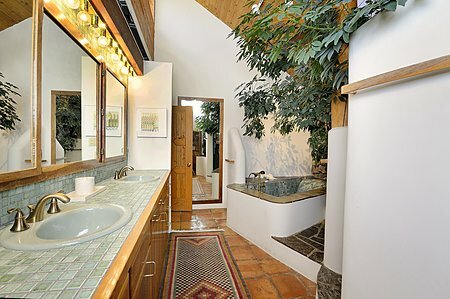 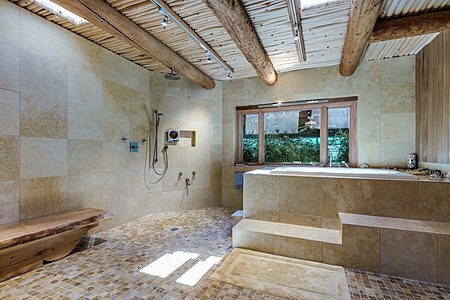 The roomy master bath is a tranquil space with a soaking tub, open shower, and subtle stone and wood accents. 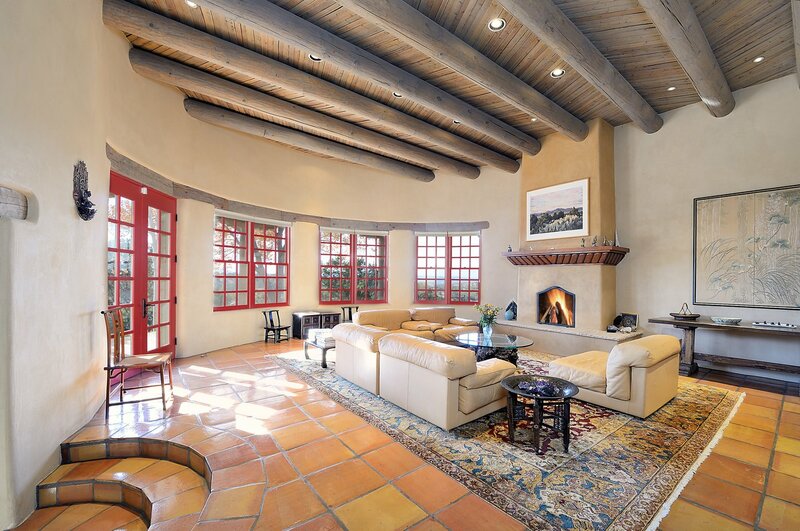 Adding to the appeal is a large theater room and a large guest suite with its own entrance. Well-separated from the master, the guest suite has two bedrooms, fireplace with insert, and a unique bathroom oasis. 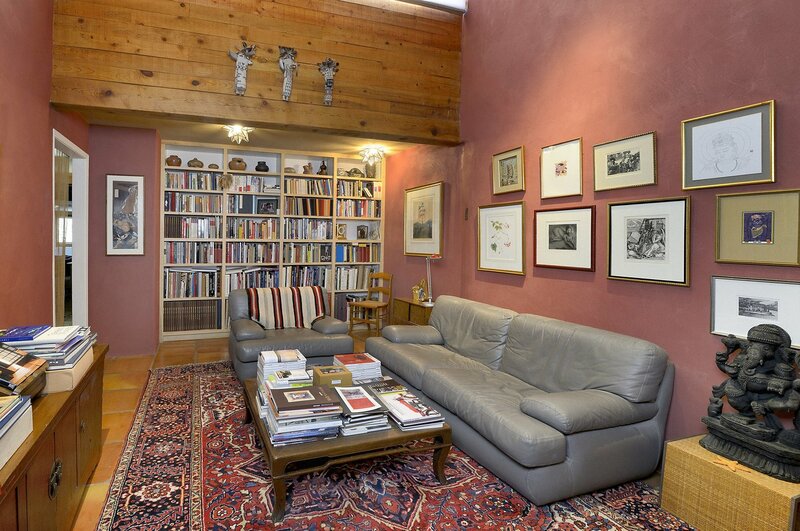 Adjacent is an inviting library; a perfect showcase for collectables. 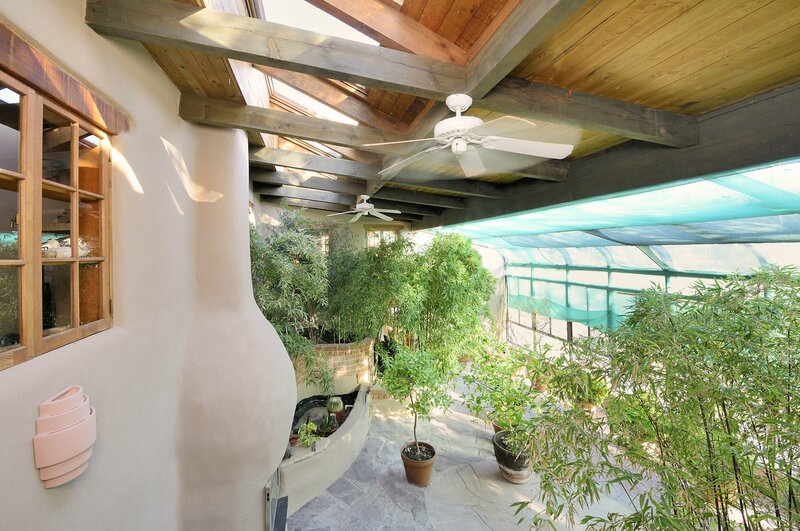 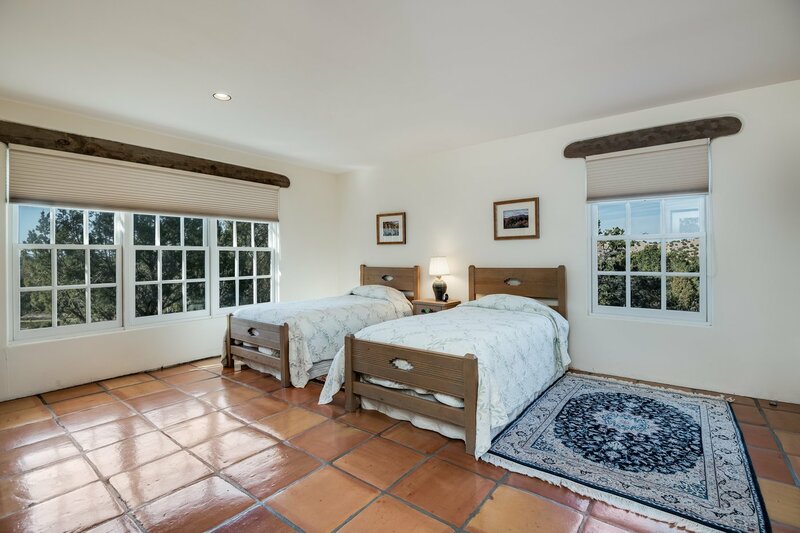 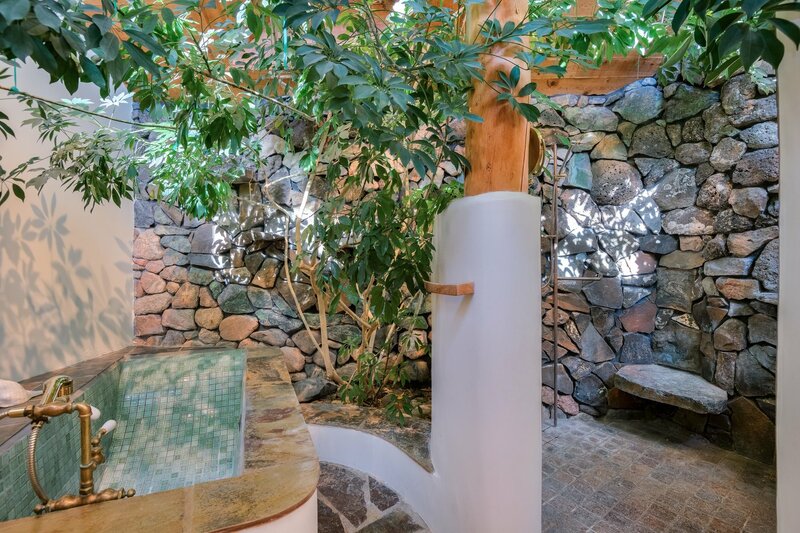 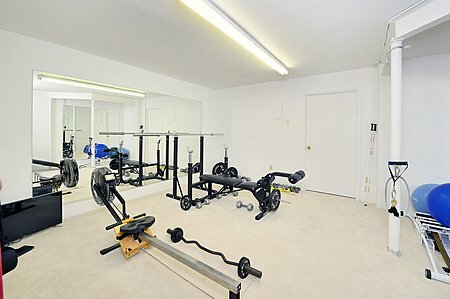 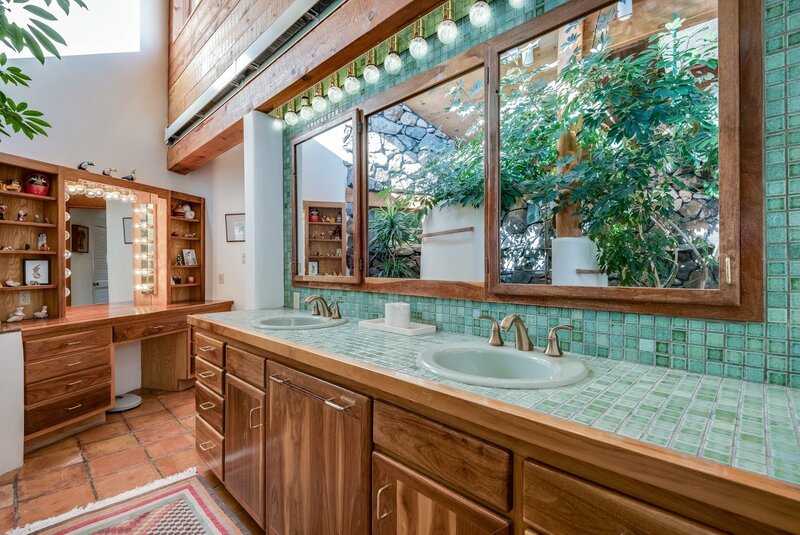 The lower level has a large greenhouse, an exercise room, and private guestroom with bath and outside entrance. 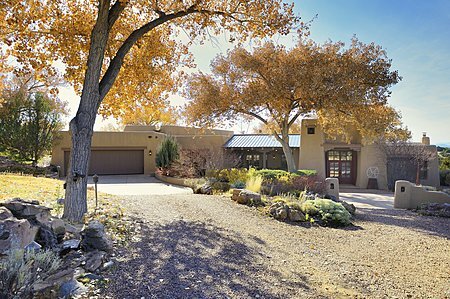 A 2-car garage completes the main house. 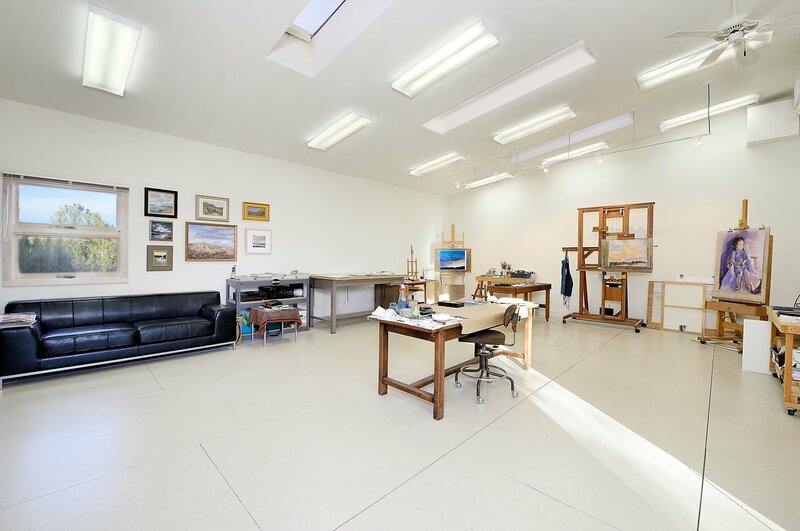 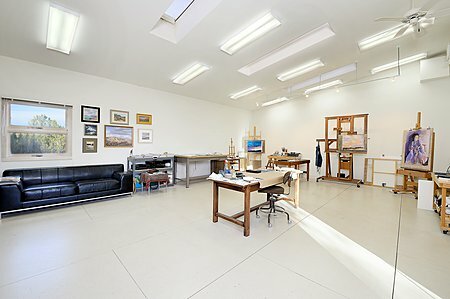 A detached 3148 sq ft building has 2 artists' studios, offices, a bathroom, spacious patio, and generous storage. 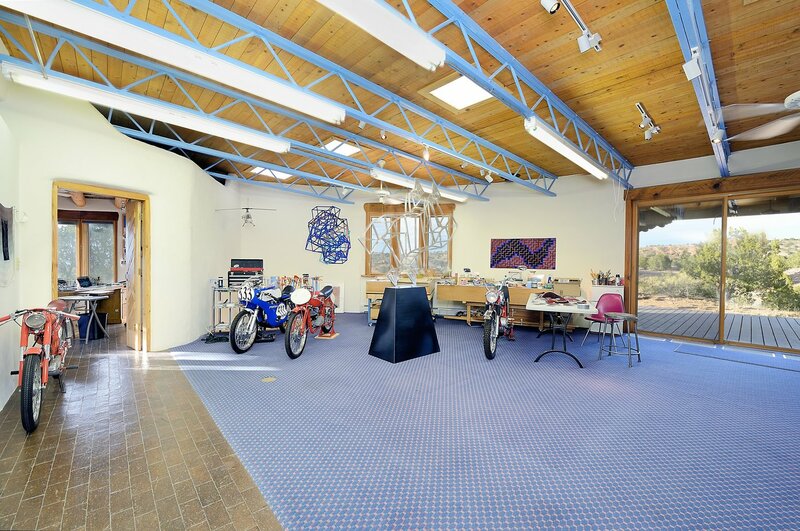 Below is a 3-car garage with tall ceilings and 2 storage rooms. 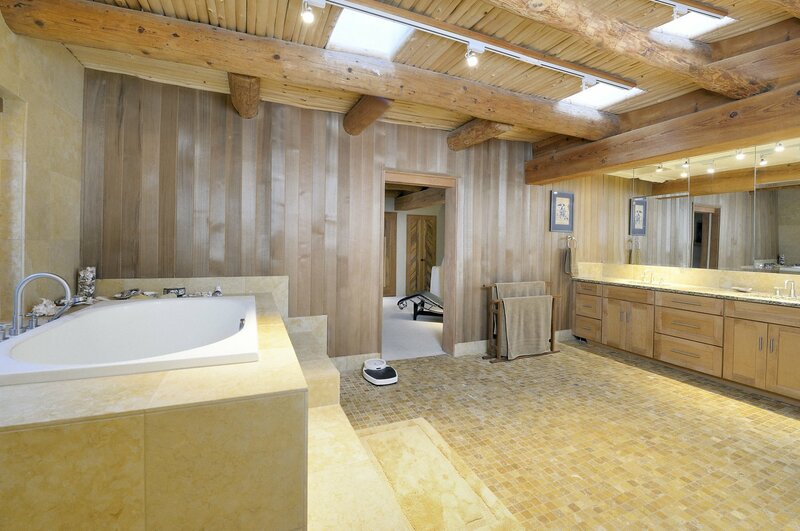 This home has a private well, 3 septic systems, 3 furnaces, and 2 propane tanks. 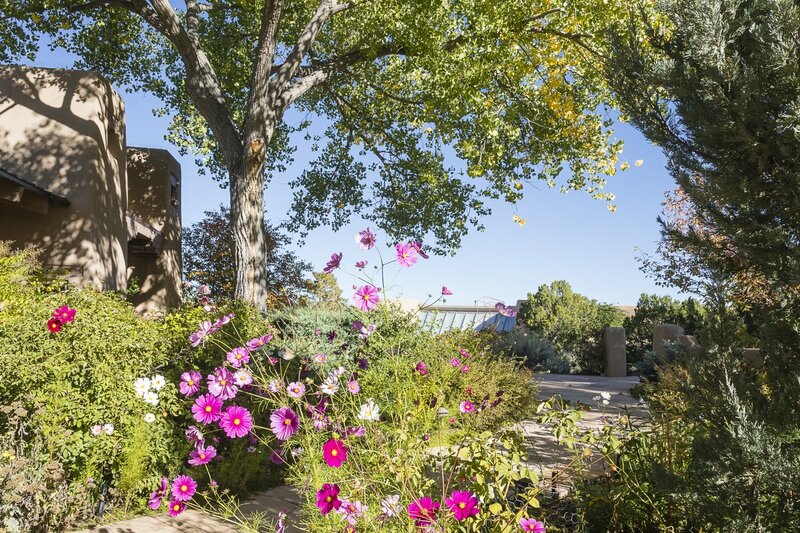 Landscaped gardens lead out to acres of natural vegetation. 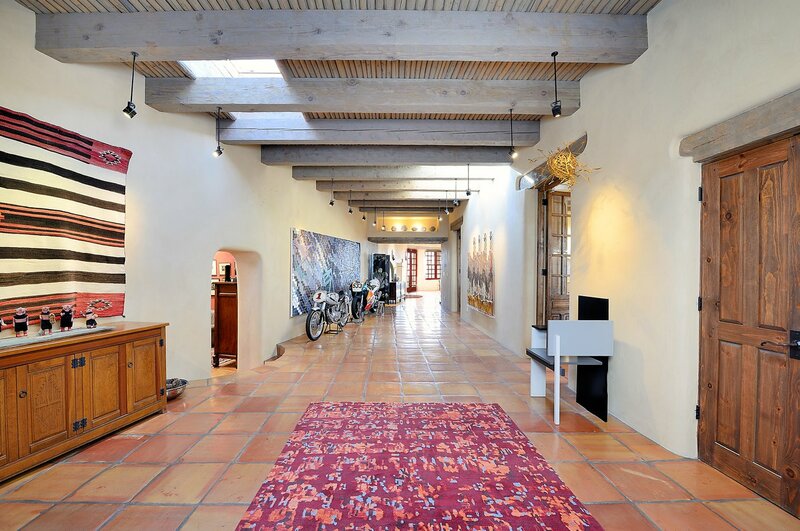 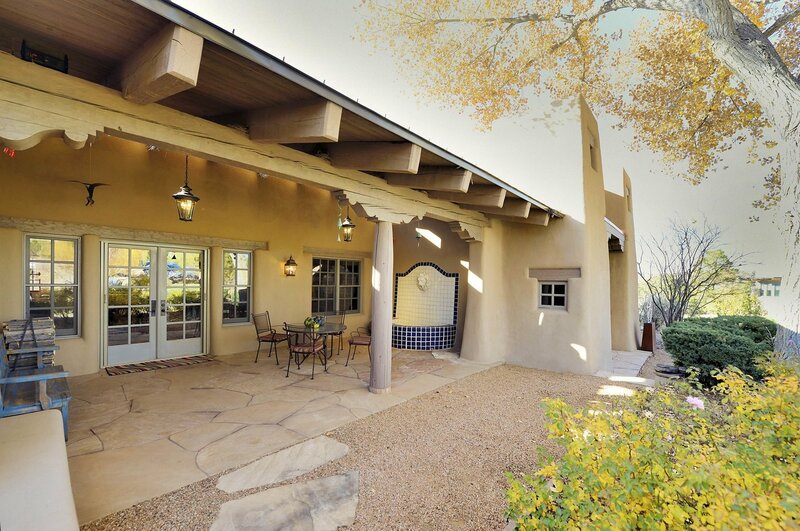 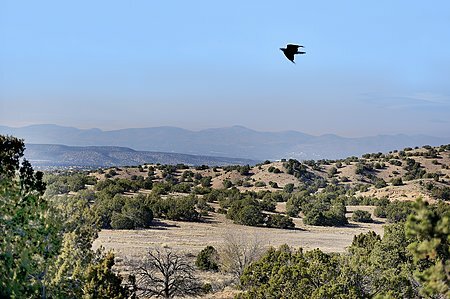 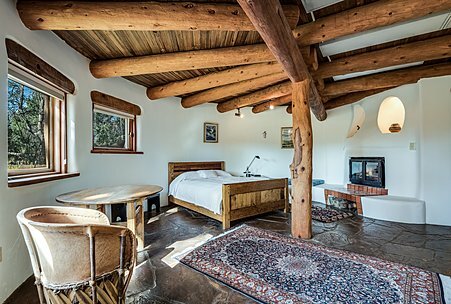 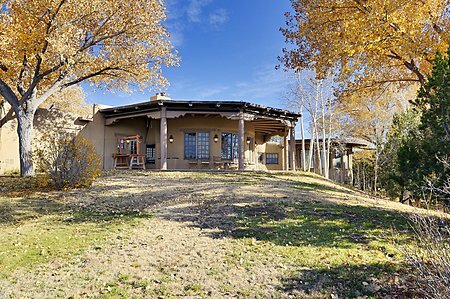 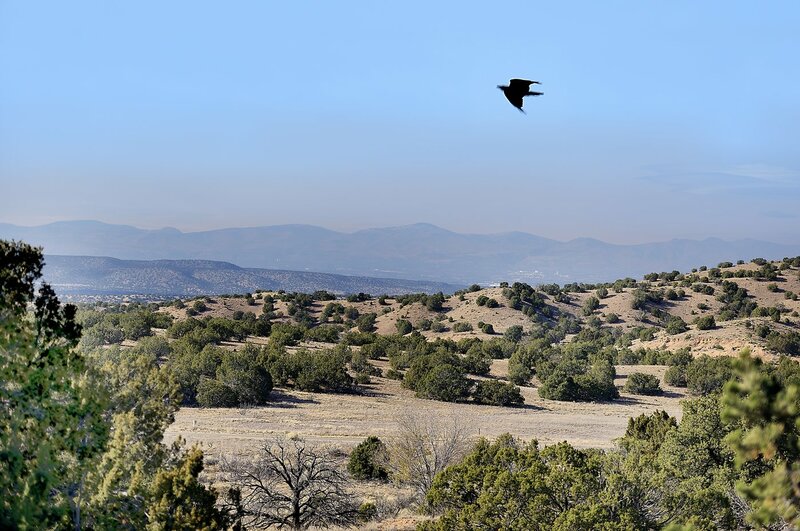 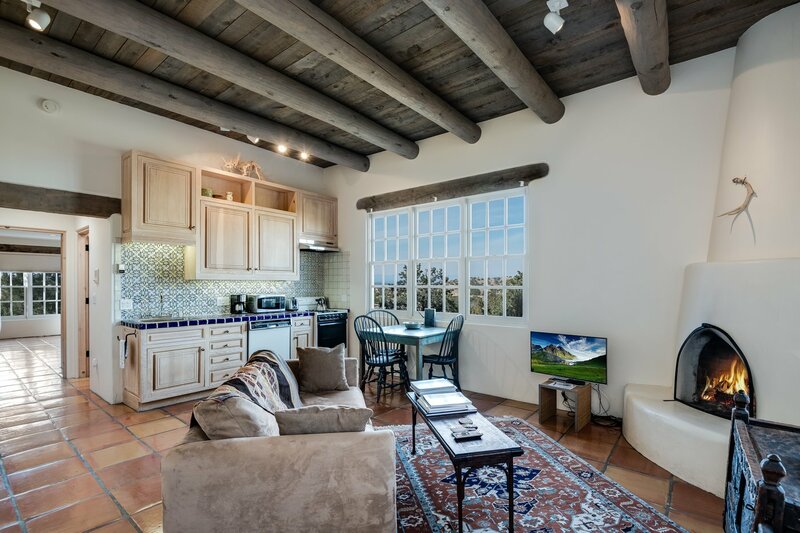 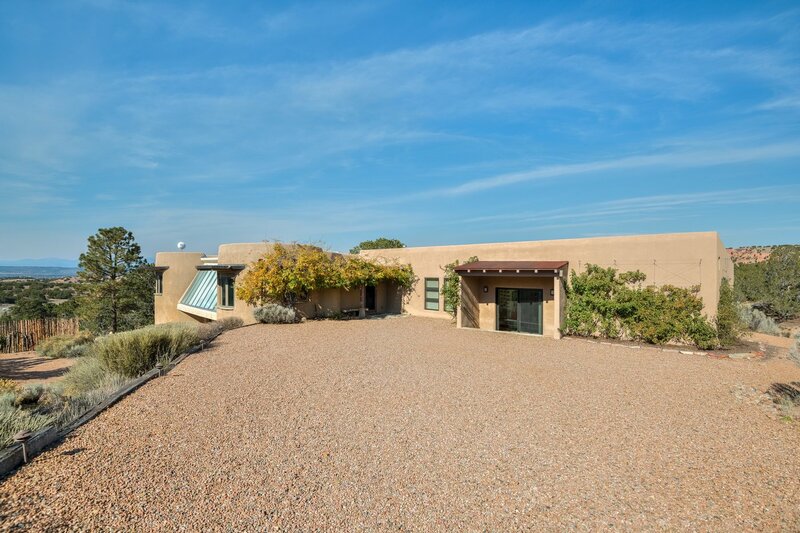 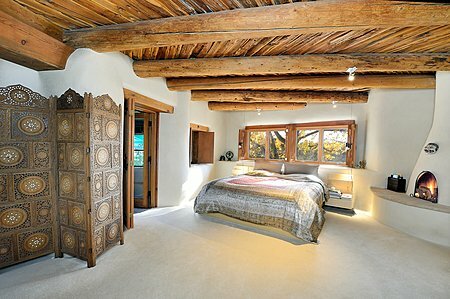 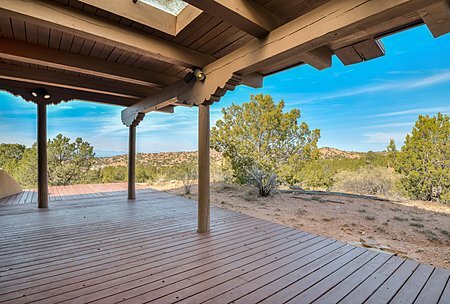 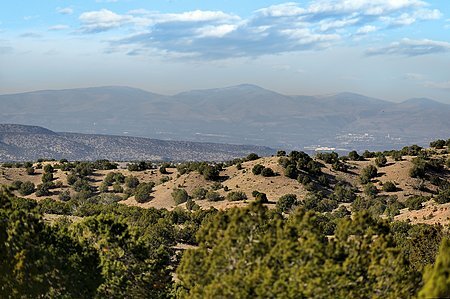 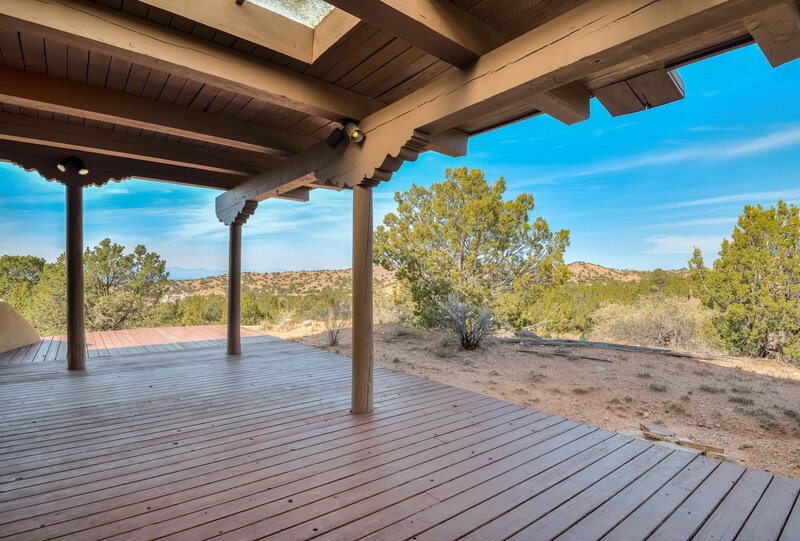 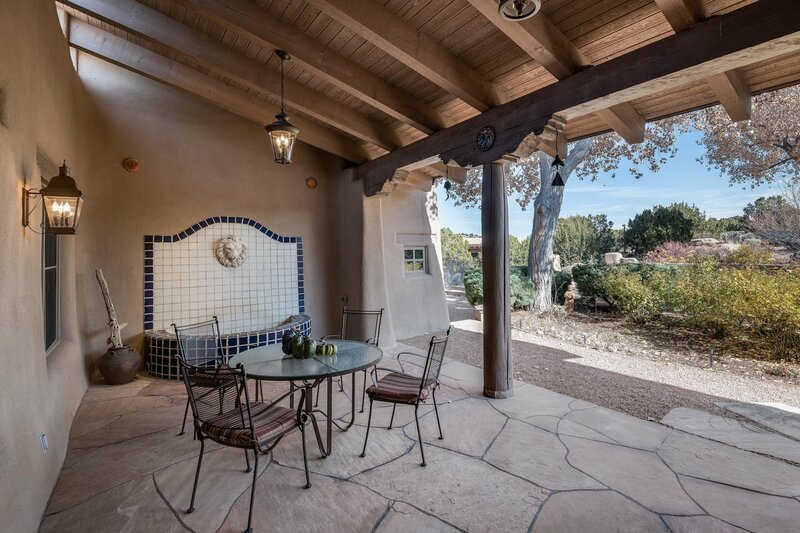 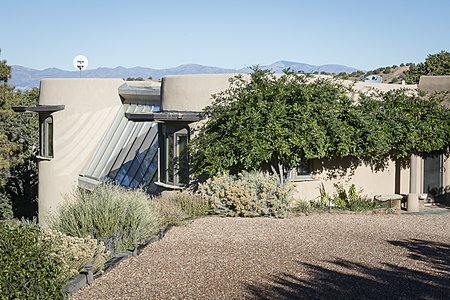 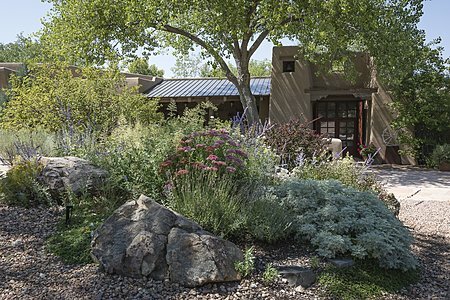 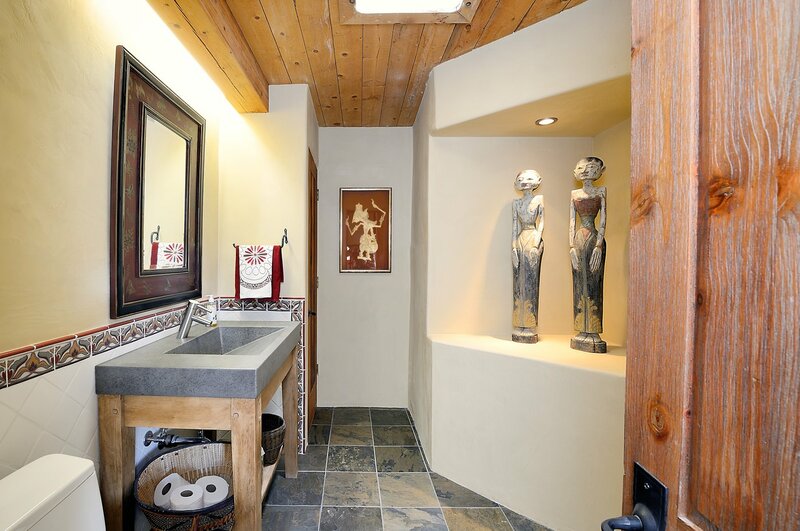 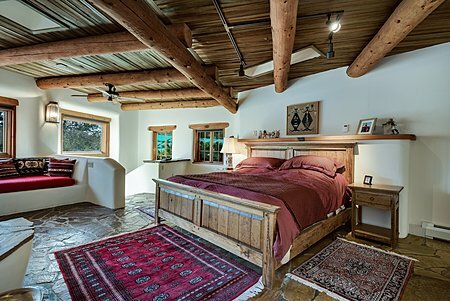 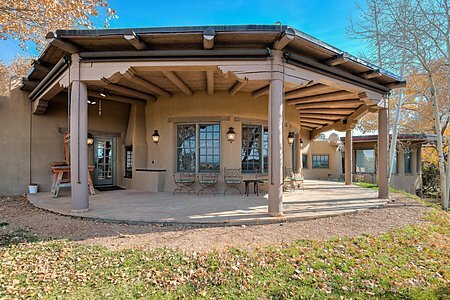 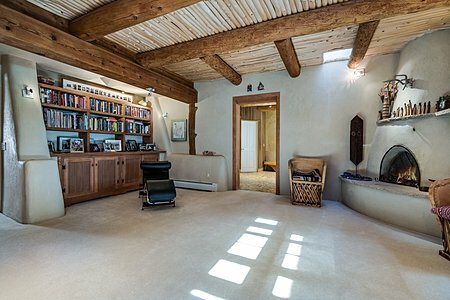 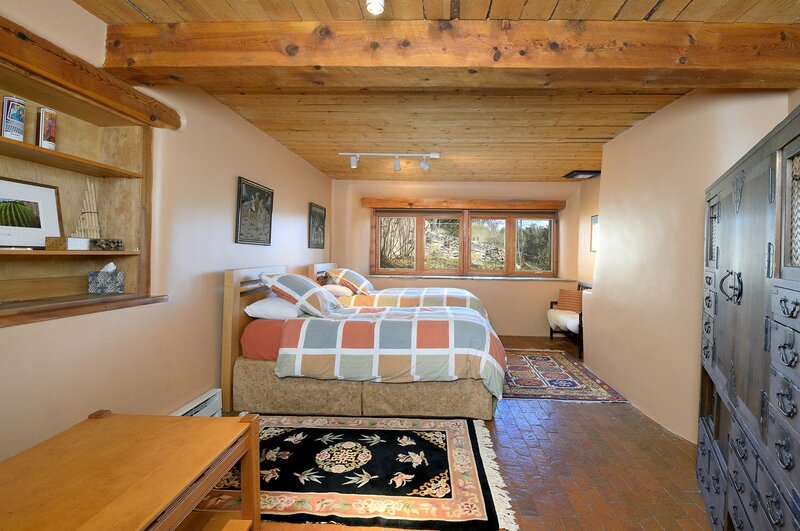 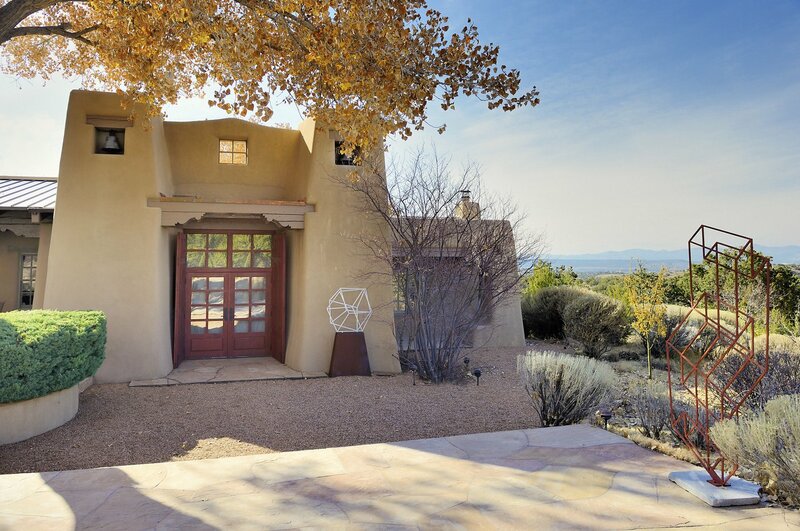 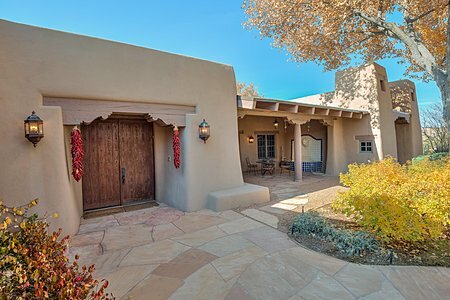 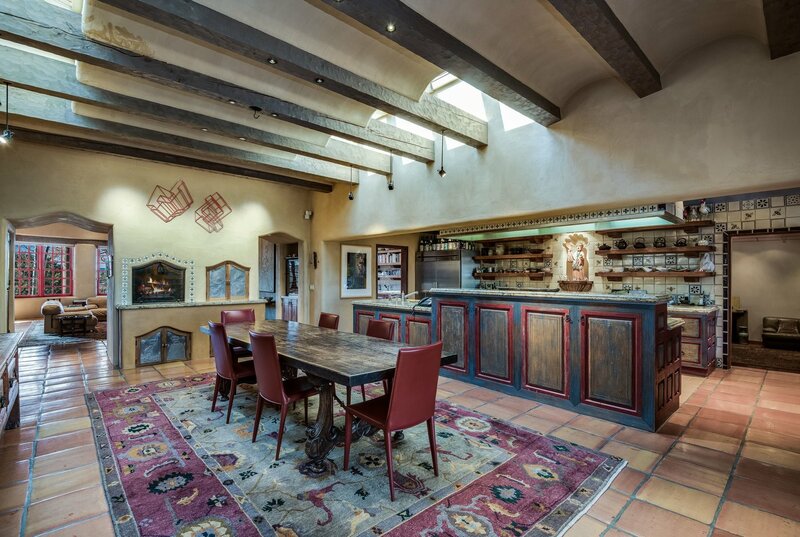 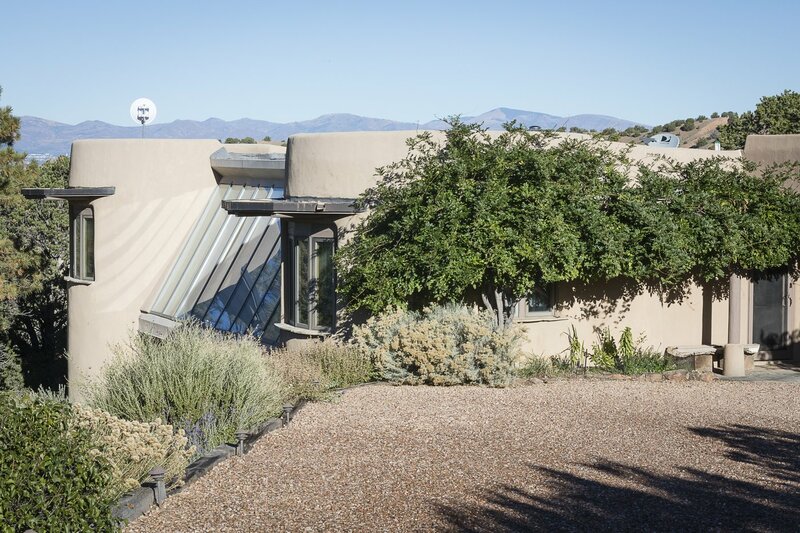 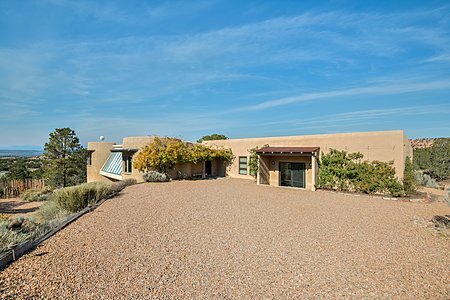 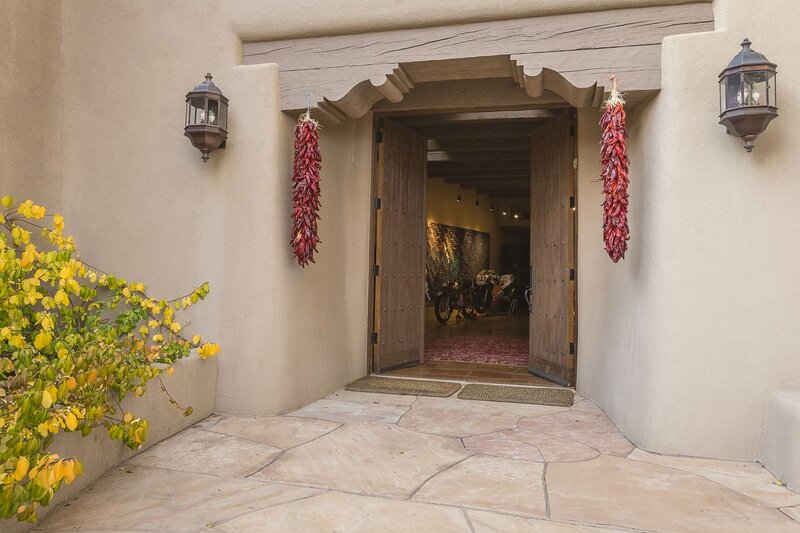 Enjoy the serene mountain and sunset views from this home in the hills just north of Santa Fe.